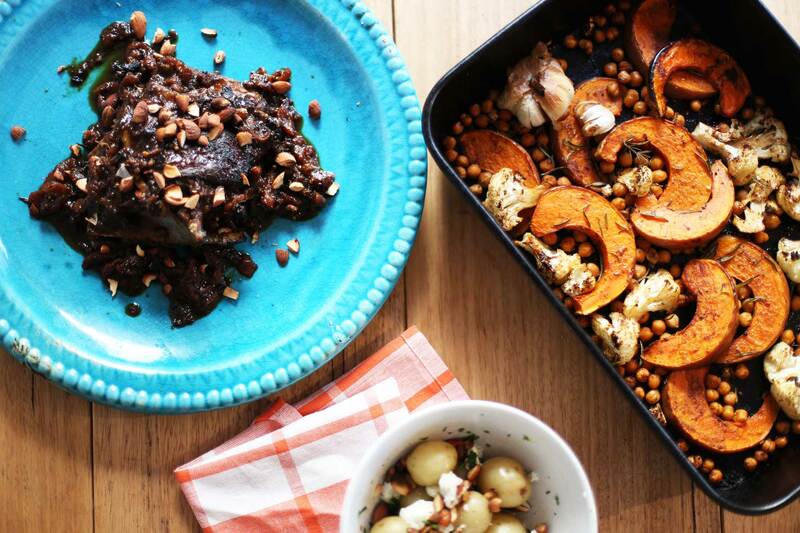 This Moroccan Lamb Shoulder and Pumpkin Roast is the perfect cold weather dish! 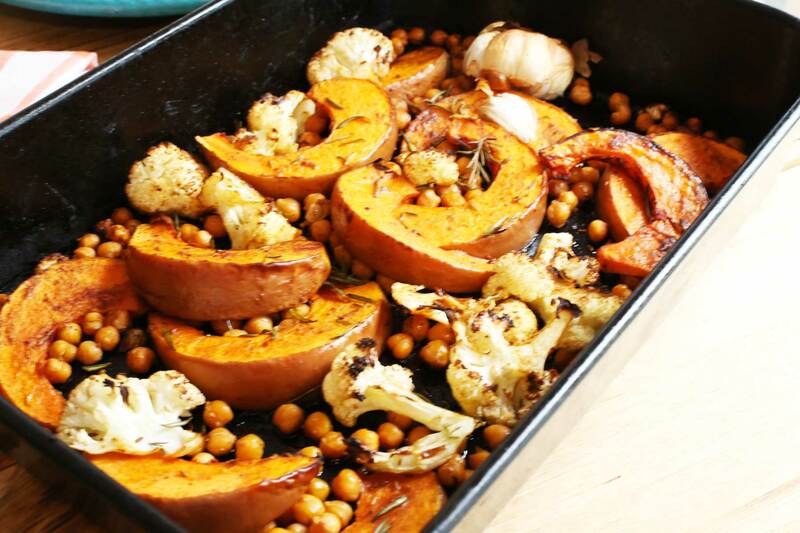 The Moroccan flavour go perfectly with lamb and the roast pumpkin along with roasted cauliflower and chickpeas add an extra dimension that I assure you will do nothing but satisfy. Lamb shoulder is one of the best cuts of meat to use for slow cooking. Not only because it is cheap, but it is also very tasty and goes extremely tender when braised. 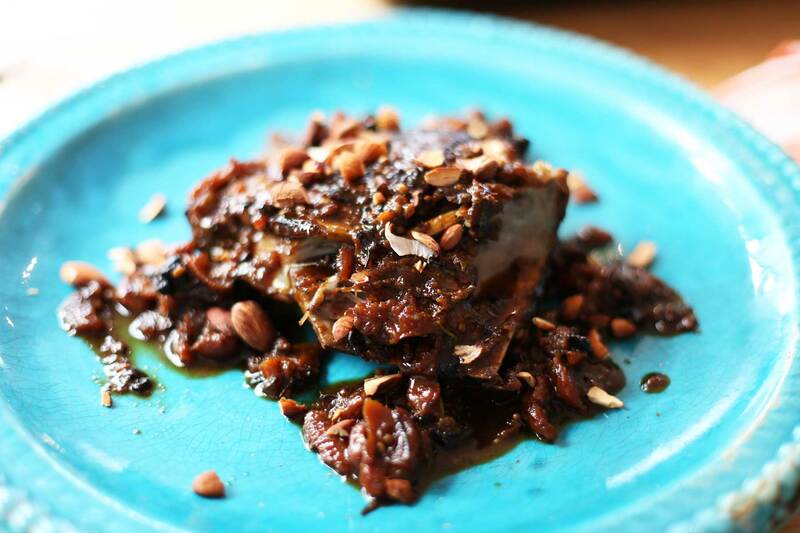 And if you are looking for a subtle yet profound way to give this Moroccan lamb shoulder an extra boost of flavour then anchovies are your secret ingredient. Please before you hit the ‘back’ button on this recipe know that I am not a fan of anchovies much at all. I assure you that you will not notice them – they will just give the dish a background hum and make the lamb sing in a way that everyone who is left sucking every last drop of flavour from their forks may not fully comprehend. Squeeze the lemon into a jar along with the olive oil. Add the rest of the herbs and spices and shake to mix. Cover the lamb shoulder liberally in all of the marinade inside a plastic bag so that it fully coats the lamb shoulder. Leave for 20 minutes to marinade. You can leave it over night if you wish – but the marinade will have done its job after 20 min. Once the lamb shoulder has marinaded, heat up a casserole dish (or pot that can be put in the oven i.e. has steel handles) on the stove until it is piping hot. Add the oil and brown off the lamb shoulder on a high heat for a few minute- this will also cook off the spices in the marinade. Slice the onions into wedges (1/4’s or 1/8’s) and add to the browned lamb along with the peeled cloves of garlic, rosemary and anchovies. Pour in the wine to de-glaze and cook off for a minute and then add the stock. Put the lid on the dish with a slight crack left open to allow steam to release and put into the pre-heated oven to cook for 3 hours. Cut up the pumpkin and cauliflower similar sized peices and drain and wash the canned chickpeas. Cover in olive oil and all of the spices. Cut the bottom of the garlic bulb off – so that you can squeeze out the unctuous roasted cloves later – and season lavishly with salt and pepper. The pumpkin and cauliflower need to be roasted on a high heat in the oven for about 20 minutes. You can do this once the Moroccan lamb shoulder is finished cooking or you can turn the heat up to 200°C for the last 20 minutes and cook them both at the same time. Just watch the water levels in the braised Moroccan lamb shoulder (it should be mostly reduced by this time – but you don’t want it to be completely dry, otherwise it will burn) and add more water/stock if necessary. Heat a fry pan on a low temperature and add almonds with a sprinkling of salt and roast for 5-10 minutes until they have browned on the inside. Watch them closely lest they burn! Leave the almonds to cool for 10 minutes and then crush under a knife and sprinkle over the braised lamb shoulder to garnish and serve.